Now to play find the cat. I bought more things off of ebay that should be delivered this week. Pictures will be for next week. Over 20 rows done this week. 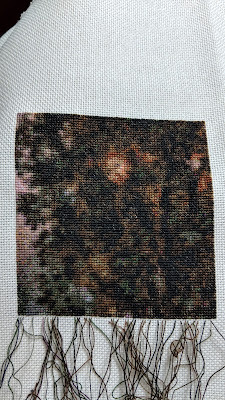 It's looking more tree-like, but I still see that face in the leaves. Odd discovery, an egg has a double yolk. Dancing with the Stars is back! In a shortened form but I'll take it. The cast is as follows with my own commentary. Adam Rippon with Jenna Johnson. Figure skater. Adam is definitely a performer and I think he'll do well with the ballroom. Latin may be a bit tricky. Arike Ogunbowale with Gleb Savchenko. All I know is she's a college basketball player. She may still be in school, but at least the season is finished so she can concentrate on the show when not studying. Chris Mazdzer with Witney Carson. He placed 2nd in this year's luge at the Olympics. Good at controlling his body, but in small increments. May come across as dancing internally rather than outward to the audience. Jamie Anderson with Artem Chigvintsev. Olympic snowboarders are hit and miss from past appearances, but I think she'll be ok for the most part. Jennie Finch Daigle with Keo Motsepe. Softball player. Have no idea who she is but hopefully she can help Keo get past his first elimination curse. 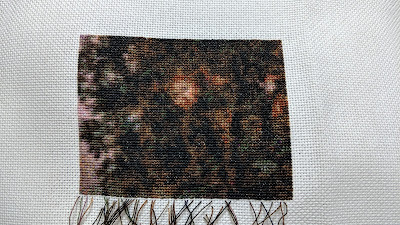 Didn't stitch quite as much as I would've liked. 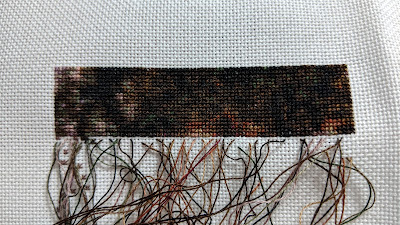 But I still managed to get almost 20 rows done since my last post. And a photo of Clyde because this post was looking too short. 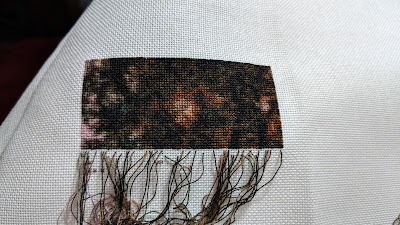 Why am I stitching another tree? I also had to take the photo this close so my camera didn't just make it a dark brown blob. And the Yankee home opener kind of messed up my posting plans. The delay to Tuesday because of snow, plus the fact that I slept really late on Wednesday, meant I forgot to write this earlier. Thankfully I was dry. Next game will probably be when it's a lot warmer.